Jacob Lawrence (1917-2000) is widely regarded as one of the most important African American artists of the 20th century for his paintings and prints that often portrayed African American life, culture, and history. This exhibition features 23 original drawings that Lawrence created for the 1970 Simon and Schuster publication of Aesop's Fables. 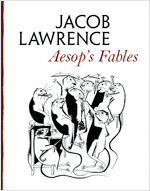 Lawrence was always attracted to Aesop’s Fables, a collection of morality tales of the late 7th and early 6th century BCE ascribed to the Greek storyteller Aesop. When given a chance to illustrate the fables, Lawrence jumped at the opportunity. A figurative artist his entire life, he was particularly intrigued by the ancient Greek storyteller’s narrative and by the challenge of casting animals, birds, and insects as his main characters. 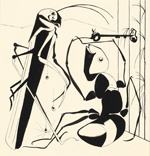 Each drawing is accompanied by the fable and the moral lesson that the story illustrates. Organized by Director John Olbrantz, the exhibition is drawn exclusively from the Paul G. Allen Family Collection. A limited number of the 1997 edition of “Jacob Lawrence: Aesop’s Fables” will be available at the museum for $18.95.